Insect Eyespots - Amazing Nature! 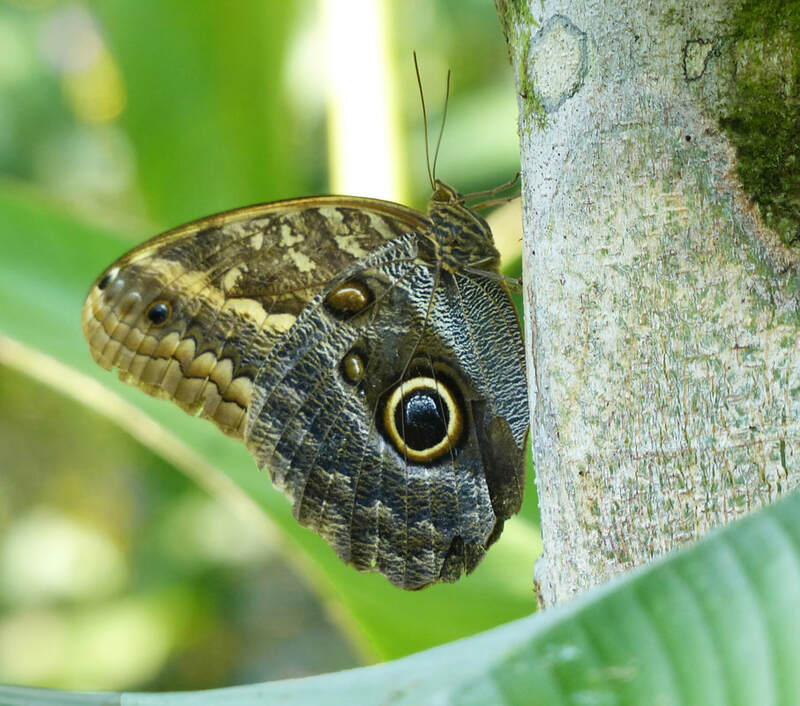 ​Eyespots -- the markings on insect wings or bodies that resemble eyes – are a defense strategy that has multiple purposes. One is to make an insect seem larger or scarier. This is actually a form of mimicry. Imagine that you are a bird looking for a juicy moth to eat. Instead of easy prey, you see the big round eyes of an animal more your size flash by. Or perhaps you are searching for a caterpillar, but instead you see a creature that looks like a snake. Would your hunger or fear prevail? 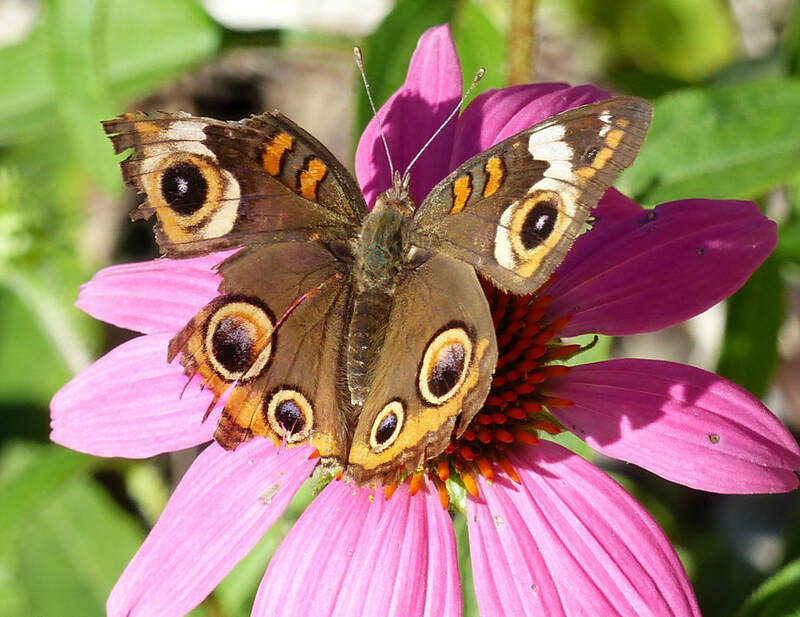 Another defensive purpose of eyespots is to deflect attacks from the insect’s most vulnerable parts – its head or body. The strike may damage part of the wing, but the insect can still fly. 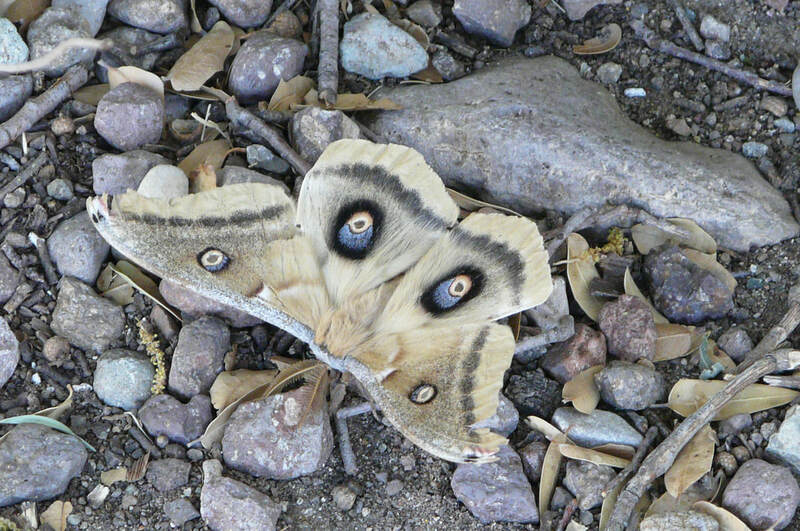 Encountering the large, mournful eyes of this huge Polyphemus Moth (Antheraea polyphemus) could spook out a predator. ​Is some big animal hiding behind the tree? 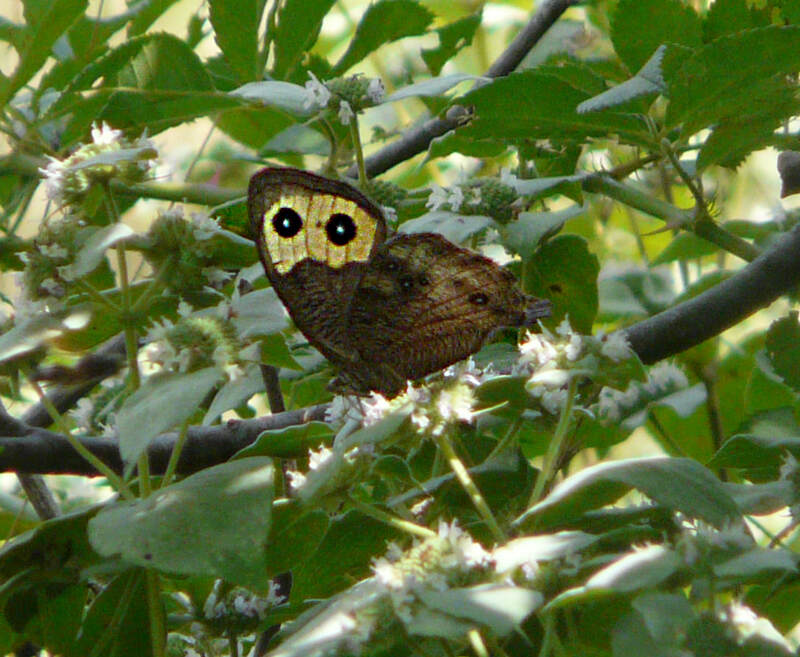 From afar, this Common Wood-Nymph Cercyonis pegalalooks somewhat like an owl. In addition, the yellow background highlights the eyespots on its wings, making them harmless targets for a predator attack. 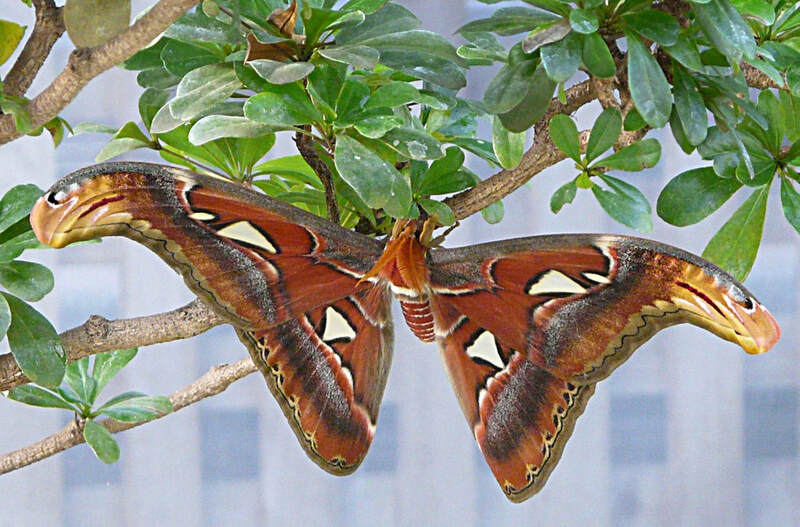 The markings on the tops of the wings of this huge, magnificent Atlas Moth (Attacus atlas) could easily be mistaken for the heads of snakes or raptors. This "snake" is just a little ol' Spicebush Swallowtail Caterpillar (Papilio troilus). 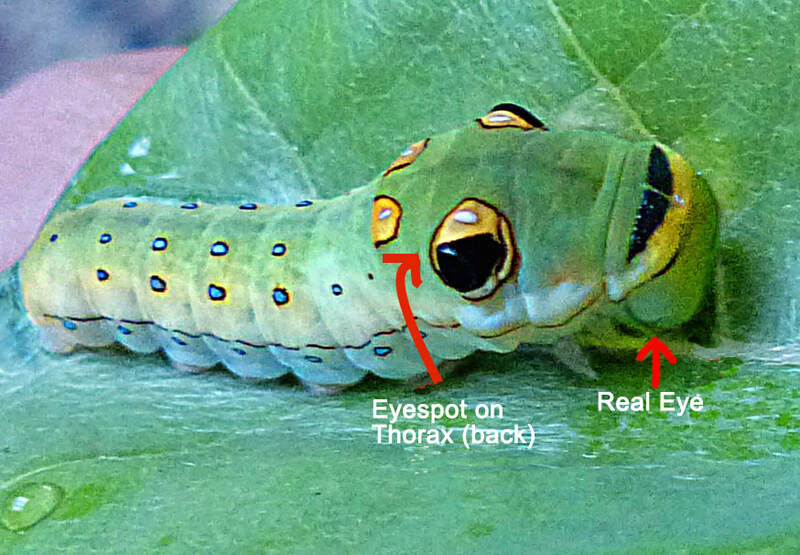 It has puffed up its body so that the large eyespots (with highlights!) on its thorax make it look more like a snake. 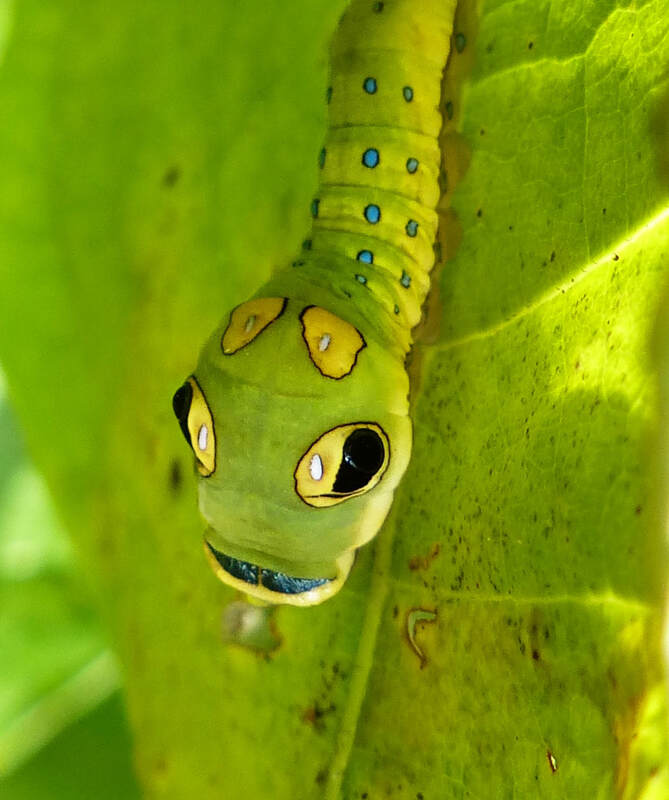 In this side view of the Spicebush Swallowtail Caterpillar, you can see that the big eyes on its back are merely pigment. Beetles are very successful. It has been estimated that about 25% of all animal life-forms are beetles -- perhaps more than 1 million beetle species inhabit the world. One reason may be their hardened wing cases (elytra) that are difficult to penetrate. One may be their variety and adaptability. 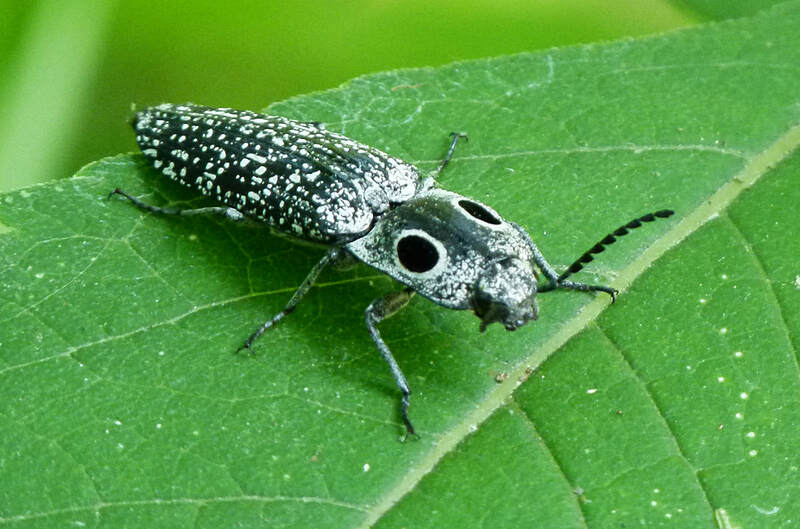 ​The eyespots on some beetle species protect them from predators by making them appear larger and not worth attacking. The big, black eyes on the thorax of this Eastern Eyed Click Beetle (Alaus oculatus) are merely pigment. Check out the small eyes on the sides of its head. Click Beetles may also play dead. In addition, they have a spring on their underside that allows them to flip into the air, scaring predators. 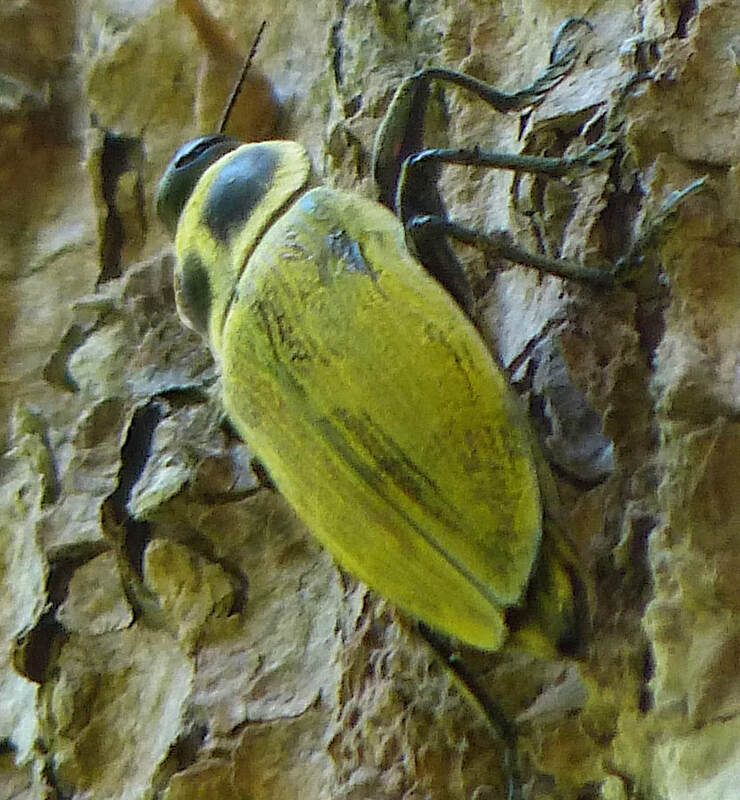 Huge black eyes on the thorax of this large (2-3 inches) Ceiba Borer Beetle (Euchroma gigantea) keep predators at bay. Alas, this gorgeous creature I "shot" in Costa Rica did not stick around to pose. Eyespots are not always large and scary. 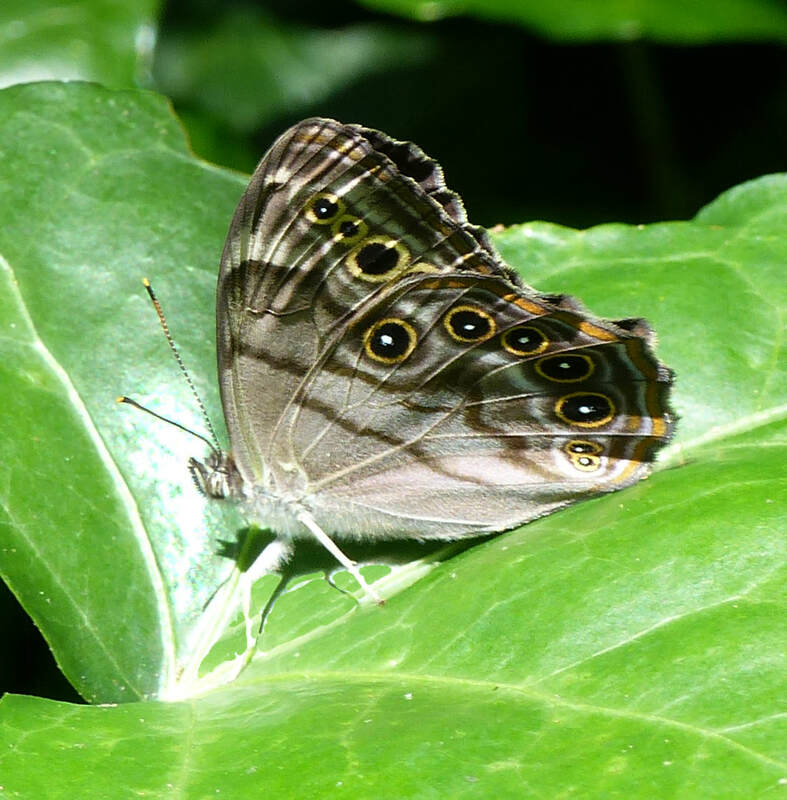 Sometimes they fool predators into attacking the edges of a butterfly's wings, causing damage which is not fatal. 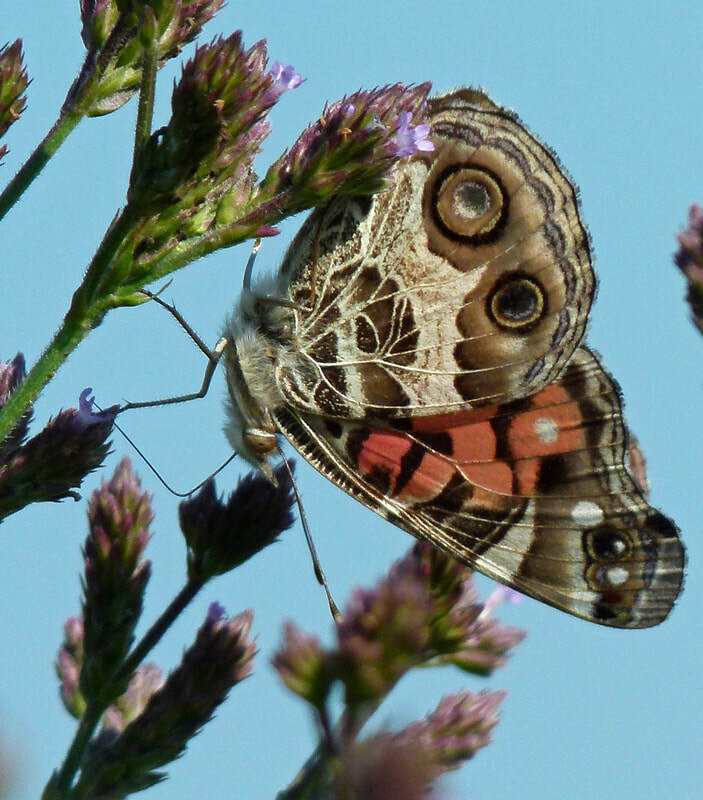 These small eyespots on the Northern Pearly-Eye (Enodia anthedon) do not frighten predators but serve as harmless targets. 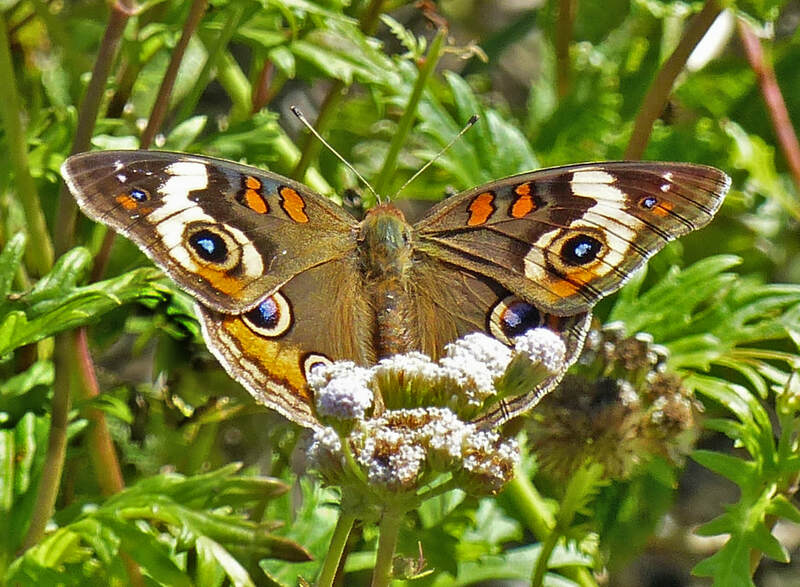 Although tattered, the Common Buckeye Butterfly pictured below can still fly. Apparently, the bird that attacked it aimed for the eyespots and not the vulnerable head or body.